When severe wildland fire situations occur as a result of extreme fireweather, wildland fires can cause extensive loss of life, property, and resources. As extreme conditions approach or worsen, wildland fire prevention/education is often overlooked as a possible source of help. 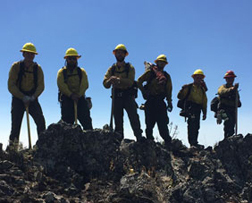 Because fire weather conditions are predictable, wildland fire prevention/education teams can be mobilized in advance of fires, when fire danger becomes extreme. Prevention/education teams are available to support any geographic area preceding andduring periods of high fire danger or fire activity. The requesting unit may use severity dollars in support of a prevention/education team. Mobilization of a team may occur when an unusual event or circumstance warrants or is predicted. A team consists of a Team Leader, a Public Affairs Officer, Prevention Specialist(s), and an optional trainee or other team members as the situation dictates (Finance Officer, Logistics Specialist, etc.). Trained interagency personnel can be mobilized through normal dispatch channels to assist in fire prevention/education at any level of an organization. The individuals ordered for prevention/education teams must have the skills required to fill the position for which they have been ordered. Refer to the National Mobilization Guide, Chapter 20, 22.9.10, Cooperative Fire Prevention/Education Teams, for ordering information.